As Italy awaits the formation of a new government, the EMIN bus arrived in Atripalda, a town of 20,000 in the South of Italy. “Erm…well…it’s actually got nothing to do with Eminem. 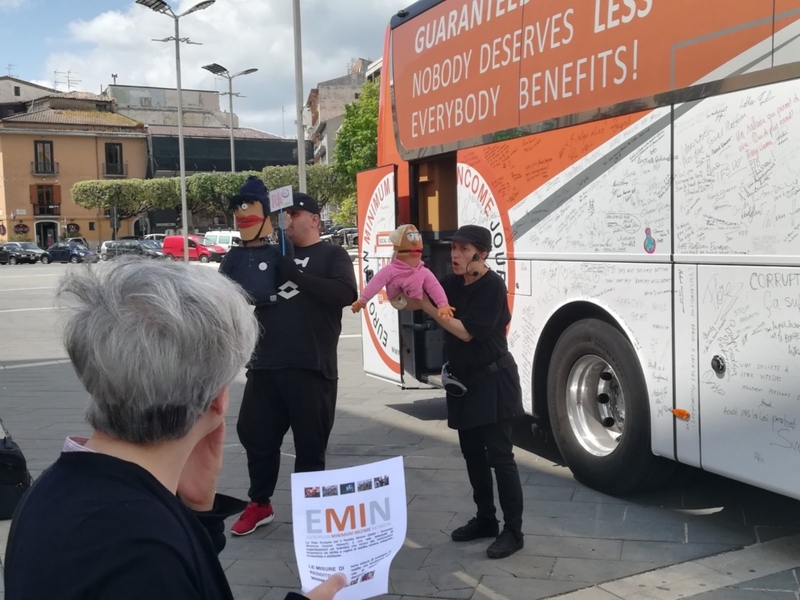 It’s #EMIN on tour, the European Minimum Income Network who are on a bus all around Europe, stopping here in Italy today, talking about poverty, inequality, jobs and the huge need for a minimum income”. Poverty is political. Its existence is a question of political priorities. Here in Italy, it is clear that poor people are still pretty far from being prioritised. On the streets of Atripalda, people were concerned. Since 2011, the post financial crisis austerity policies of the EU have hit Italy hard. There aren’t enough jobs, they said. Young people are being forced to join the black market or to leave. Then there are people who have jobs but can’t afford to live a decent life – the working poor. Still today, Italy is a story of two countries with serious inequalities between the North and the South. Whilst this is not to say that people in Northern Italy do not face poverty, the situation for people in the South is more harsh. Across the country, some 15% of people are at risk of poverty. But three times more people in the South face that risk than their neighbours in the North. 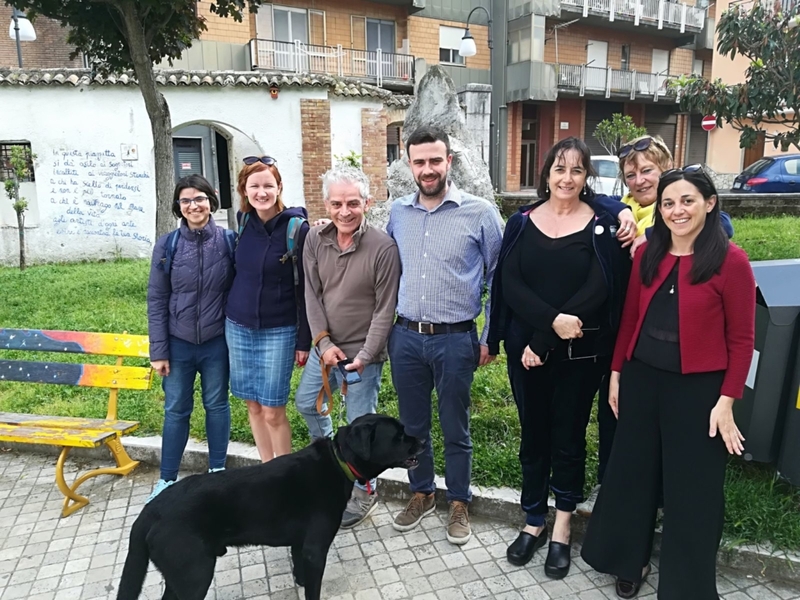 Reflecting on all of this at a political debate in the City Hall of Atripalda this afternoon, Nancy Palladino, City Councillor, said that a European approach to the question of minimum income is really important. The concept of the minimum income is new to Italy and a lot needs to be done to shift attitudes around why it matters. She was keen to learn from experiences across Europe. Carmine De Biasio, also from the City Council said that the gap between Southern Italy and much of the rest of Europe is very clear. The minimum income makes a lot of sense in this context. Everyone is exposed to risk of poverty and the minimum income is a basic right. Poverty cannot go on being inherited from generation to generation, as is currently happening. Anne Van Lancker, EMIN policy coordinator, stressed that there are many good reasons to defend adequate and accessible minimum income schemes, proving that they are only necessary for people who need them but also for the whole of society. She explained the purpose of our EMIN journey and said that even if no country has a perfect scheme, a lot can be learnt from other countries’ experiences. 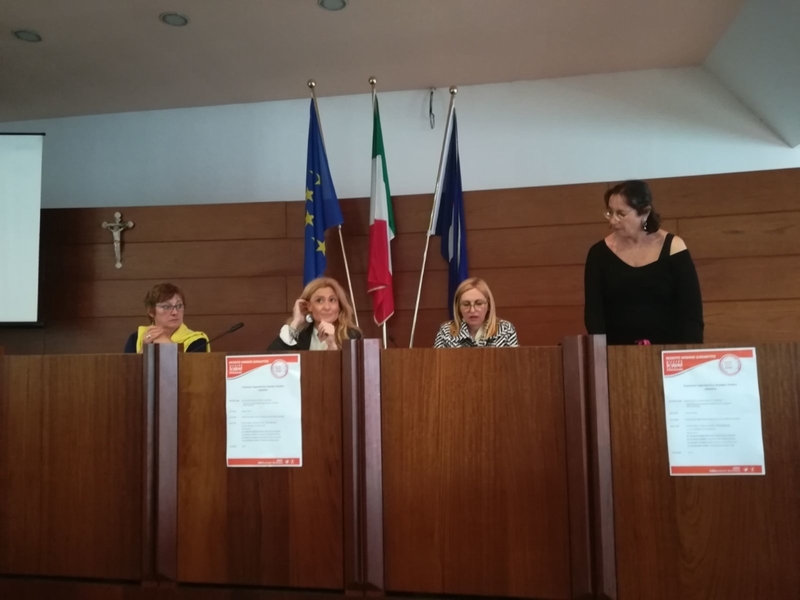 “We are born and grow up in Europe and opportunities come with this, but there are two sides to the story”, said Nicoletta Teodosi from CILAP, the Italian network of EAPN. Since 2011, austerity policies have created a bad situation for people in Italy and other countries in Europe. Against this, the minimum income now brings rights to people across the entire country. A lot of behind the scenes work had to happen for the minimum income experiment to start. Yet the scheme is not widely known. In other words, people are not always aware of their rights. And a lot more is needed to raise awareness among people on the rights that they already have. As Italy waits for confirmation of what is likely to be an intensely Eurosceptic coalition government of Liga Nord and the Five Star Movement, the question must be raised as to what the future is for fighting poverty and inequality as part of a wider European effort?